These cupcakes were inspired by the ones I saw in New York, where cupcakes are not only tasty, they’re big! Being a home baker, I really don’t get out and buy enough bakery cupcakes, but when I do I appreciate that bakeries make them in jumbo muffin tins. You get more for your money and it gives you a better ratio of cake to frosting . Plus, the cupcakes seem to be moister due to there being more inside area and less surface area to potentially dry out. In the past I’ve always made cupcakes in standard home baker size muffin tins, but I think from now on I’m going the jumbo route. 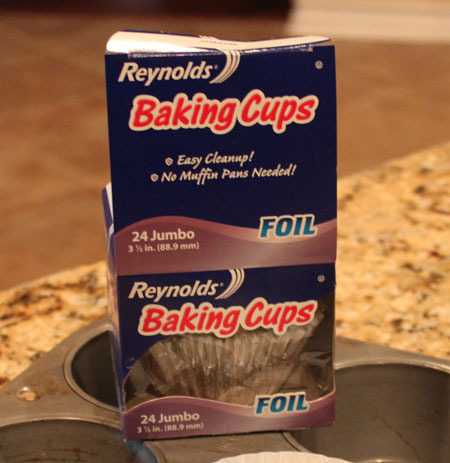 I love my Nonstick 6-Cup Texas Muffin Pan and recommend buying one, but if you don’t want to buy a jumbo muffin pan, some grocery stores sell the new Reynolds jumbo cupcake cups. The baking cups have foil liners and they say you can use them without a muffin tin. I tried this and didn’t like the way the sides spread, but you could probably just set them into the standard size muffin tin for a little support. By the way, I have a new favorite decorating tip. It’s called the Ateco #867 and it’s the easiest tip for frosting cupcakes because all you do is give one squeeze and you’ve got a beautiful, pointy, star topping. I stuck a cherry in the center because I like the way stemmed cherries look, but you could stick an almond or something else there instead. Preheat oven to 350 degrees F. and line 10 jumbo muffin cups with jumbo liners. Whisk the eggs, milk, vanilla and Amaretto together in a large liquid measuring cup. In bowl of a stand mixer, mix the cake flour, sugar, baking powder and salt. With mixer on low, add the butter one tablespoon at a time until you get pea size lumps. Add half of the milk mixture and increase speed to medium high. Beat until light and fluffy. Reduce speed again and add remaining milk. Increase speed and beat for another minute. Stir in mini chocolate chips (or cinnamon chips). Divide batter equally among cups and bake for 25 minutes on center rack. Let cool completely. Frost with Amaretto Cream Cheese frosting. **If you don’t have whole milk but you do have cream and reduced fat milk, measure out 4 oz minus about 2 teaspoons of milk, then add 2 teaspoons of cream to make 4 oz. Note: The cake part of this recipe was adapted from Cooks Illustrated’s Cook’s Country and uses the reverse creaming technique. Amaretto Buttercream would be great! Looks great. I’ve noticed that the cupcakes served in gourmet cupcake stores in my neck of the woods tend to be much more dense than store-bought ones, or those I bake myself. Sounds tasty! These look perfect for Valentine’s Day, my boyfriend and I are both huge fans of amaretto! Did you like the cream cheese frosting? I was thinking an amaretto buttercream might be yummy too. These look delicious…I like the idea of cinnamon chips. 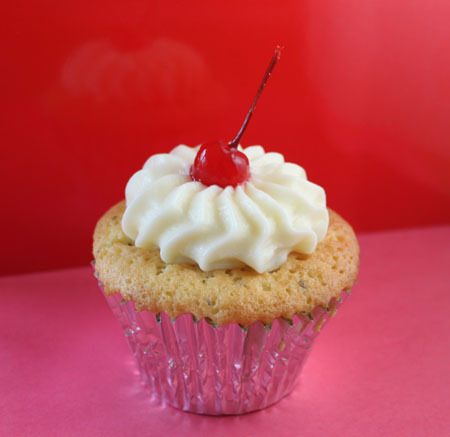 I’ve over dosed on key lime pie and need a cupcake! Interesting! I’m always about the mini ones, but I never thought about how the size would affect the texture. Looks so great when they are big too! i feel the same way about jumbo muffins–they do stay more moist than the smaller ones. but this combo sounds so good. i would love to add some toasted coconut to the top for decoration and a bit of flavor? what do you think? Laura, I loved this recipe! It’s similar to CI’s other one and to Shirley Corriher’s — the one where you add the whipped cream the end. This recipe should give you a cake with the moistness of box cake and the buttery flavor of homemade. Which reverse creaming method are you using? What do you think of the reverse creaming method for cupcakes? I just made a batch of vanilla ones that I wasn’t happy with (coarse and dry despite my valiant efforts to make them soft and slightly moist). I used the standard creaming method and was debating seeing if the reverse was better. Oooh pretty. I love amaretto. So pretty! A cherry on top makes any dessert better. I love my jumbo cupcake pans. One of the things I use them for is to make individual breakfast stratas for brunch. And, you know I love those jumbo chocolate pumpkin muffins too! These cupcakes sound great. I wonder how they’d be with the Frangelico languishing in my cupboard? I LOVE amaretto flavoring! That alone totally makes me want to make these. Pretty….wonderful flavoring with the Amaretto.